Thokozani worked as a guide and wildlife ambassador for many years before joining Wildlife ACT. In 2015 he was honoured with a Conservation Hero Award from the Disney Conservation Fund. Recipients from around the world were nominated by non-profit environmental organizations, and the award recognizes local citizens for their outstanding efforts to protect wildlife and wild places and engage communities in conservation. Thokozani Mlambo is an extraordinarily motivated endangered species conservationist. 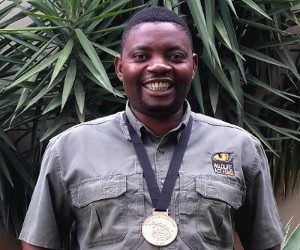 As a Community Conservation Liason with Wildlife ACT, he works tirelessly, rarely taking days off, to spread the conservation word through his sprawling community of KwaJobe, which sits on the border of uMkhuze Game Reserve. Wildlife ACT’s Community Conservation Liaison’s (CCL’s) are well-known and trusted in the communities, where they work tirelessly to raise and maintain support for wildlife conservation.